What happens when methane hydrate melts? aerobic oxidation of methane by bacteria in the water column. During anaerobic oxidation of methane in the sediment the microbes use sulphate (SO42–), the salt of sulphuric acid that is present in large quantities in sea water, for the methane decomposition. In this process methane is converted to bicarbonate (HCO3–). If the bicarbonate reacts further with calcium ions (Ca2+) in the seawater, calcium carbonate (CaCO3) precipitates, which remains stored in the sea floor over long periods of time. That would be the ideal situation, because it would make the potent greenhouse gas methane (CH4) harmless. At the same time, hydrogen sulphide (H2S) is produced from the sulphate, which provides energy to chemosynthetic communities, including symbiotic clams and tubeworms. During aerobic oxidation in the water column, however, bacteria break down methane with the help of oxygen (O2). In this process, carbon dioxide is produced, which dissolves in the water. Carbon dioxide contributes to ocean acidification. Furthermore, aerobic oxidation of methane consumes oxygen. The depletion of oxygen in the water column could create or expand oxygen minimum zones in the ocean, which are a threat for fishes and other sensitive organisms. Rough estimates suggest that anaerobic and aerobic oxidation of methane together currently convert around 90 per cent of the methane produced in the sea floor before it can reach the atmosphere. The more slowly methane migrates through the sea floor or through the water column, the more effective the microbes are in converting it. A prerequisite for this kind of degradation is that the methane molecules are dissolved in water. Methane can only be degraded by the bacteria in this form. If the methane is released rapidly from the hydrates, it could rise in the form of gas bubbles that are not accessible by microorganisms. The microbial methane filter would thus fail, at least in part, if the methane hydrates break down very rapidly and large quantities of methane are released at once. There is also a problem at shallow water depths, where the methane bubbles cannot completely dissolve in the water over the short distance from the sea floor to the atmosphere. In order to better understand such processes and to be able to make predictions about the functions of the microbial filters, researchers are currently investi­gating natural methane sources on the sea floor, so-called cold seeps, which constantly release larger quantities of methane. These include near-surface gas hydrate deposits, mud volcanoes, and natural-gas seeps in shallow marine regions. These seeps are a kind of natural model where the behaviour of methane in the ocean can be ­studied. If we understand how nature reacts to these methane seeps at the sea floor, it will help us to estimate the consequences of larger methane releases from gas hydrates. The data obtained at the methane seeps should also help to improve the precision of mathematical methane hydrate simulations. 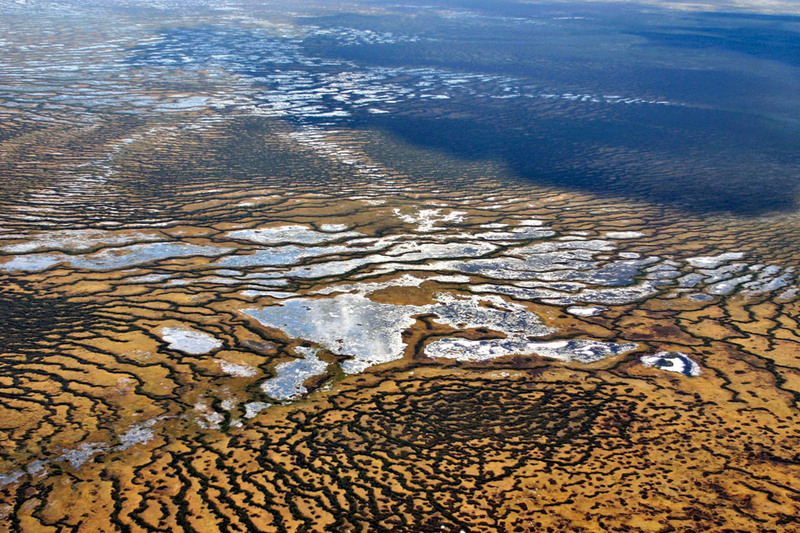 2.20 > Large quantities of methane hydrate are stored not only in the sea floor, but also on land, especially in the perpetually frozen permafrost ground of the Russian tundra, such as here in the Russian republic of Komi. 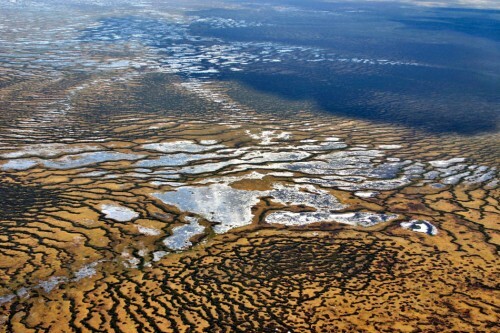 Scientists are concerned that the permafrost soils could melt due to global warming and thus release the methane hydrates. could have fatal consequences. Gas hydrates act like a cement that fills the pores between the fine sediment particles and stabilizes the sea floor. If the methane hydrates decompose, the stability of the sea floor is reduced due to the missing cement and the possible generation of excess pore pressure. 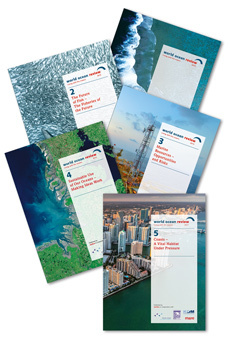 In the worst case, large parts of continental margins fail. The resulting submarine landslides might cause severe tsunamis. Massive mass movements occurred during the last ice age and the following deglaciation. The trigger was probably not always warming of the atmosphere, but also the opposite. Because large quantities of water were stored in the ice during the last ice age, sea level was around 120 metres lower than it is today. Especially in the shallow ocean regions, the water pressure was so low that massive amounts of methane hydrate could have been destabilized. Direct evidences for such slope failures caused by decomposing gas hydrates have not yet been found. There are, however, some indications suggesting a process in the past. Signs of seeping fluids are almost always found in the vicinity of slope failures. These slopes were possibly destabilized by gases released by decomposing gas hydrates and liquids. Researchers also, however, definitely see the possibility of a reverse relationship: it is conceivable that slope failures and the resulting reduction in pressure on underlying sediments caused the dissociation of methane hydrates at the continental margins, thereby releasing large amounts of free gas. The slumps would have been the cause rather than the result of gas escape. These uncertainties highlight the need for further research. It is, however, fairly certain that the disappearance of methane hydrates could lead to serious problems. In the field of methane emission research today, the Arctic is one of the most important regions worldwide. It is believed that methane occurs there both in the form of gas hydrate in the sea and as free gas trapped in the deep-frozen permafrost. Methane deposits in permafrost and hydrates are considered to be very sensitive in the expansive shallow-shelf regions, because with the relatively low pressures it would only take a small temperature change to release large amounts of methane. In addition, new methane is continuously being produced because the Arctic regions are rich in organic material that is decomposed by microbes in the sediment. The activity of these microbes and thus the biological release rates of methane are also stimulated by increases in temperature. Hence methane emissions in the Arctic have multiple sources. International scientific consortia are now being established involving researchers from various disciplines – chemists, biologists, geologists, geophysicists, meteorologists – which are intensively addressing this problem. No one can yet say with certainty how the methane release in the Arctic will develop with global warming, either in the ocean or on the land. This research is still in its in­fancy.